For the past 50 years, Challenge has been has been serving two distinct groups: people who want to work and employers who need a trained, qualified, diverse workforce. 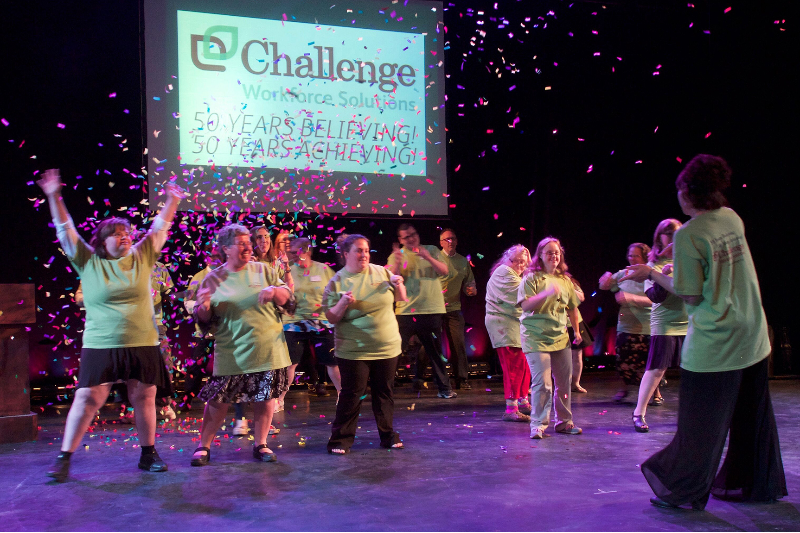 It has always been Challenge’s mission to create pathways to employment so people could achieve their dreams of independence through meaningful work. From 1974 to1982 Jimmy worked at Challenge in the recycling center, IC dish rooms, the mail department, landscaping, and cleaning area businesses. In 1982 Jimmy was hired as an hourly employee for Commercial Cleaning and has been there for over 35 years. This year he received a Lifetime Achievement Award at our 50th Annual Awards Celebration. ~ People like Michael, who was here the first day Challenge opened its doors in 1968. After 50 consecutive years of dedicated service, he retired from Challenge this year. Michael took part in the entire Challenge story; from its humble beginnings to where we are today. During the past half-century he has taken part in a variety of jobs, from sorting nuts and bolts, building furniture, working in the mail room, and shoveling parking lots, to preparing foods, and washing and sorting bottles at the glass plant on Route 13. His addictions worsened, his rap sheet lengthened, and finally in 2014 he lost custody of his daughters. This was his turning point. Angelo started attending twelve-step meetings, found a supportive church community, and came to Challenge. Angelo attended Job Club, a six-week program of intensive career exploration, job readiness training, and hands-on job search assistance. With an extensive criminal background and no high school diploma, Angelo’s barriers to employment were substantial. Despite these obstacles, Angelo landed a maintenance job at Texas Roadhouse and very soon thereafter was recruited by a manager at Five Guys Burgers and Fries. He has been working on the line for two years and was recently asked to apply for a management position. For three years, he has been gainfully employed, clean and sober, and living with his fiancée and their daughters. Our community is stronger and more diverse because of the dedication and support that Challenge has shown people with disabilities and barriers for the last five decades. The answer is simple - no one in our community does what we do! With the support of our community Challenge will continue to serve for the next 50 years!